MyBinding is pleased to offer a high quality selection of neckwear and wrist wear conducive to all of your visual identification needs. Pick from a variety of styles including cost effective vivid and spectacular colored elastic neck cords, beaded neck chains, breakaway vinyl straps, and casino style wrist coils. 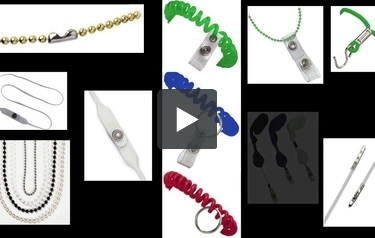 These neck and wrist wear identification supplies are available in numerous different lengths to satisfy any need. Choose the color, size and style to fit your project, application or business. You can even create your own custom length neck chains with MyBinding beaded chain spools. These products are tons of fun! Ideal for conventions, meetings, etc. Expandable size up to 9"
Ideal for access cards, keys, badges, etc. This is MyBinding video. MyBinding.com is proud to offer high-quality line of neckwear and wristwear to suit all of you visual identification needs. Choose from a variety of styles, including cost-effective colored elastic neck cord, beaded neck chains, breakaway vinyl straps and casino style wrist coils. Our neck and wristwear ID supplies are available in a number of different lengths to meet virtually any application, and you can even make your own custom-length neck chains with our beaded chain spools. Give us a call. Our customer service team is waiting to help you find what you need. Let us help you easily present and keep track of your visual identification. When image matters, MyBinding.